In general, the Catholic Church deals with death and suffering well. In many cities across the country, the Church ensures that the unclaimed dead receive a decent funeral with prayers and dignity. Marathon Monday with grace and pastoral skill. Three weeks after the tragic bombings and the surreal events that followed that week, in Watertown (less than a mile from my house), a public debate has begun over what to do with the body of Tamerlan Tsarnaev, the 26 year old who apparently conceived and executed this criminal act against humanity. Crowds are protesting outside the funeral home that agreed to take his body. City officials in Cambridge, MA and across the state are refusing to allow the body to be buried there. Both candidates for US Senate in this year’s special election have chimed in and found a rare point of agreement in standing in opposition to this criminal being buried in the commonwealth. All the while, the body of a human person awaits a final resting place. This debate is tragic and risks confirming the worst suspicions that many have about Americans. Let us be better than these criminals. Let us meet hatred and the willful destruction of human bodies with respect for life. The body of Tamerlan Tsarnaev, should be buried. If no other cemetery will do it, Catholic cemeteries should rise to the occasion. (Note: all of my deceased family members in the USA are buried in the Boston area) At the very least, the Catholic community could leverage its social, political and moral capital (not to mention it’s influence in the funeral industry) to find a discreet resting place for a human body. The burial of the dead, even the bodies of sinners, is a corporal work of mercy that is central to the Christian life of discipleship. When we bury the dead with respect we honor not the person and their evil and sinful deeds, but the God who created each and every one of us in God’s image. Even the Romans allowed suspected terrorists and murderers to be buried. The precedence that this sets is disconcerting. Maybe the grave should be unmarked and hidden away as to not create any more conflict, but there ought to be a resting spot. The only way to overcome hated and the sacrilege of human destruction is love. 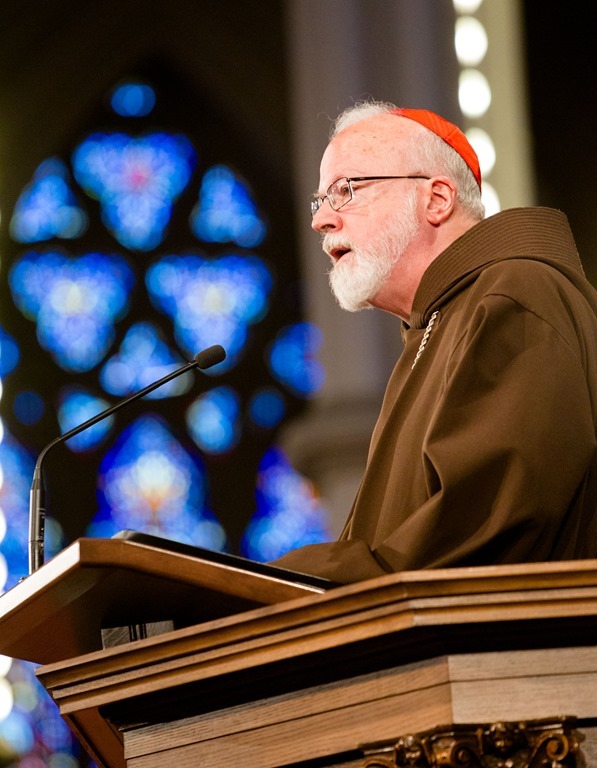 Let us, as Cardinal Sean O’Malley urged after the event become “a people of reconciliation, not revenge.” The quick and somber burial of this criminal will go a long way in putting feelings of hatred to rest and reminding the world that each and every person has human dignity. Instead of spending our time protesting outside a funeral home, let us work proactively for healing and the creation of a culture of life around the world. Thanks again for your touching comments. Here is another story from Boston.com featuring a video interview with the funeral director. All the out of state offers have also been rejected. What type of precedent will this set? I find it unfortunate that both the candidates in the Massachusetts special election for US Senate have said no to burying Tsarnaev in Massachusetts. It’s a cheap and easy way for them to come across as tough on terror/crime. Especially since they’re both Catholic, so they should be hip to whole “corporal works of mercy” thing. I do, on the other hand, understand the fear some cemeteries might have – his grave is almost definitely going to be vandalized. There are six cops guarding the funeral home right now, so I imagine those who run cemeteries are nervous about what might happen. Maybe it would be an unmarked grave. Thanks Steve! There are creative solutions. The Catholic church is one of the most influential actors in the business of caring for the dead (not the grotto of Mary outside the funeral home). Creative solutions could include private cemeteries of religious congregations, the cem. on Long Island in Boston Harbor which is blocked to the public, etc. Clearly, most agree that it would have to be undisclosed as has been the case in other high profile cases like this one. Thanks, Kevin, for writing about this. I find the whole situation appalling. In history, we have had similar problems with the bodies of the dead only in cases of damnatio memoriae and during the plague: that we should tolerate a public curse on a dead human person (with serious psychological issues, of course) in the 21st century, and that political and religious leaders have not clearly denounced this is very troubling to me. That everyone is consciously or unconsciously comparing this man to Osama bin Laden, instead of comparing him to a rampage shooter who causes great pain, but who should obviously be buried like everyone else, is troubling. Of course, there are risks of vandalizing a marked grave in these situations, and there are solutions to that. Of course we should support and be sensitive to the victims, but not by playing pass the parcel with dead bodies. For me, as an ousider residing in the US, it does expose a very dark vindictive side in the American self, and I sincerely hope that troubled young men living here as outsiders don´t get to see this dark side very often. (Some troubled young men in foreign countries get to see that side all too often as drones hover over their villages…but we are made to believe that we will be safe in Boston as long as the US will pump in more money to its federal agencies which are supposed to keep those persons out, and keep its citizens and residents from getting in contact with them abroad…). A perfectly dignified way to care for his remains would be cremation, remains scattered as mulch to help some living plants grow, so some good will come of it, and no vandalizing of the grave site since no one needs to know where. Only problem would be the expense….